Tiny waist is a very important question for a lot of people... Most of us want to achieve flat stomach because aside from making us feel healthier, it would also make us more confident with the way we look. Nevertheless, we still confused as how we can look fit, try desperately to lose the accumulated fat overtime but all of our attempts end up with failure. Physical effort is the first step to get rid of your stubborn belly fat. We are going through 5 exercises which will definitely lean and add a definition to your midsection. Each exercise require at least 30 seconds as beginners. Assume a push up position with arms and body in a straight line from your head to your ankles. Keep your hips level, raise your knee toward your chest and repeat with the other knee. Mountain climber exercise engage the most muscles in your body. It will not help you lose belly fat only but also add your core, develop your cardiovascular system and empower your lower body. Lie down on your back, knees up to 90°, support your head with your hands and lift your feet. Now, bring the elbow as the knees slightly to your midsection. 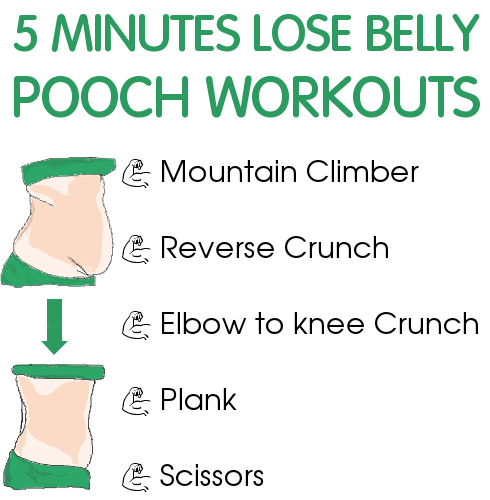 Aside from the pain you may feel, reverse crunch is very a very affective abdominal workout which help you lose belly fat rapidly and burn much calories. Lie down with your hands behind your head, make your low back flat, now lift and rotate your torso to one side and bring the knee of the opposite leg. Return to the starting position and repeat the movement for the other side. Be aware of your leg angle and don’t place your back in the ground. This is a great exercise especially for beginners, you will feel the burn into your waist. Come down into a push up position, make your arms right under your shoulders. The reason why this exercise is called “Plank” is that it make the body as straight as a plank, so you need to keep your body straight and your legs slightly apart and hold on. The most common mistakes are arching the back which will make it even more harder or lifting the gluteus, this may seem easier for you but your arms will be tired very quickly. The difficulty of this exercise lies on holding the “in line “ position for a certain length of time. In the starting position, you are required to keep your right leg and your left hand straight. The other leg should be bent and support your head with your right hand. Now, lift your left arm and right leg and try to touch as further as you can. However, at the end of the exercise don’t put your leg in the ground, keep it a little bit higher. Do what you can, and repeat it everyday..